Sunday night saw Canberra’s Transit Bar stamp our wrists with dinosaurs as the long line of people filed in. It was a nice touch, and set the tone for a great night. First up were Sydney’s The Griswolds. Their upbeat, shimmering guitar pop was certainly enjoyable, but it was only around the second half of their set that they started to demand the audience’s attention. Their set culminated not with their one and only single – “Mississippi” – but with the thundering and impressive track “Heart of the Lion”. A quick chat with the band revealed that it’ll be appearing on their forthcoming EP and will be their next single, and I think they’re definitely going to be a group to look out for. 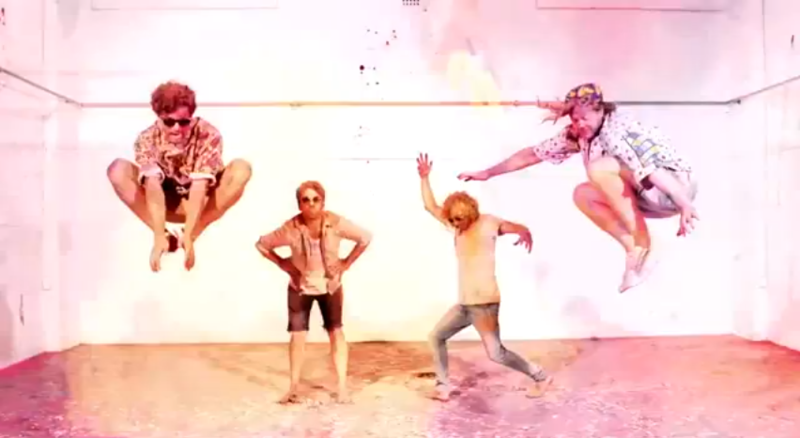 The only gripe I have with The Griswolds is that – as triple j’s Gemma Pike has pointed out before me – they delve into the whole African-tinged-pop niche. It’s not necessarily a bad thing. Bands like Fool’s Gold have absolutely nailed the sound, and on a local level, Jinja Safari have explored it extensively. The Griswolds just need to be careful they don’t pigeon-hole themselves there, that’s all. Brisbane four-piece Millions took to the stage next, and it didn’t take much encouragement from them to get the crowd on their feet. Their charming rock isn’t in your face enough to be considered raw, but there was something about the lack of showy flourishes or effects – the simplicity of their sound – that was incredibly endearing. Their slower numbers felt slightly reminiscent of Arctic Monkeys’ more delicate tracks like “Riot Van” and “Only Ones Who Know” (that’s a good thing), without sounding derivative. It’s the structural solidarity of Millions’ music that makes it so attractive to the ear. They draw you in without any pretense, and their live show is very much the same. There aren’t many bands that can write in this style without getting dull, and I hope we get to hear much more from them in the future. 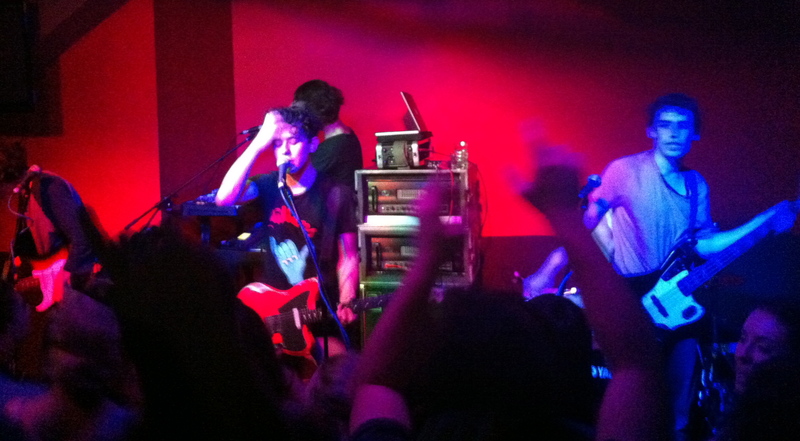 The crowd was well and truly packed in (for Transit, anyway) when Last Dinosaurs hit the stage. They’ve skyrocketed in popularity since the release of their debut album, resulting in a place on the 2012 Splendour line-up, and it’s pretty easy to see why. One of the highlights of their set was introduced as a slightly heavier number, but one that you can dance to. “I Can’t Help You”, the second track from their debut album In A Million Years, rattled throughout the bar, feeling much more dense and powerful than the poppy guitar licks we heard through the set. It was a welcome bit of variation, and as strong as they were, I can’t help but wish the set held a bit more of that in store. Notably though, they pulled out a rather special dual cover of Modjo’s “Lady (Hear Me Tonight)” and Spiller’s “Groovejet (If This Ain’t Love)” which sounded excellent. Last Dinosaurs certainly sounded great in the small space they had. Their hooks were mechanically precise, and rang clear throughout the venue. Sean Caskey’s vocal melodies filled the bar, and gave everyone just enough space to audibly join in – most notably in closer “Zoom”, which was clearly the song most were familiar with. Assuming Last Dinosaurs keep up the hard work, and tour solidly, I think they’ve got a very bright future ahead of them. As strong as their music is, the defining factor in their success will be whether they keep themselves on their toes and move around. But for now, this is a very young, talented band, that know how to put on a show – and a damn good one at that.